You have probably heard that short sales are anything but short. That is true, but how long does a short sale really take? I wish there was an easy answer for that. My shortest short sale took 6 weeks. My longest short sale was 2.5 years. Since you are “shorting” the bank there is an approval process that can take up the most time. During the housing crisis, many banks streamlined that process. Others have not. Some banks can take up to 30 days to approve the file. If there is a mistake or something else that needs to be submitted, it could add an additional 30 days. So while the answer is a difficult one, there is one HUGE thing you can do to make the short sale process as SHORT as possible. Get your paperwork together and to your agent as quickly as you can. The more time that passes can cause more delays, as the bank will request updated statements and pay stubs. That will add time to the review process. On average, you can expect a short sale to take 3-6 months. Make sure to hire an agent that is familiar with distressed properties and get your paperwork together to get the home closed as quickly as possible. In the land of real estate there are hundreds of acronyms. Often it leaves the consumer and, sometimes even the real estate agent scratching their head trying to decipher the lingo. BPO is one you might hear in the short sale, foreclosure or relocation world. BPO stands for Broker Price Opinion. It is similar to an appraisal but it is not as precise. An appraisal is done by a licensed appraiser. A BPO is done by a real estate agent and can be done in one of two ways, exterior or interior. In an exterior BPO the agent will be asked to take photos of the outside of the home. They will need to verify the address and note any exterior damage to the property. They will then compare the property with other nearby properties to come up with a price. An interior BPO is a bit more intensive. When conducting an interior BPO often times the agent will need to make contact with the occupants of the home. They will need to contact either the agent on the property or the owners themselves. Any damage to the property should be noted. The bank could request pictures and measurements be taken. The agent will then give a valuation based on comparing the property with other nearby properties in similar condition. Often times the lender will request certain information and it will be up to the BPO agent to provide what they are asking for. Once all the data is compared the agent will give the bank an idea of what the home is worth. This opinion is important, especially in short sales because it will allow the bank to set a price that it will accept for the property. If you are trying to sell your home in a short sale the BPO is especially important to you. The bank will rarely take less than 86% of the suggested value. The BPO can make or break the short sale. Anyone who has been involved in a Short Sale knows that it is anything but a short… sale. So, why do they call it a Short Sale and what exactly is it? A Short Sale is when a homeowner gets approval to sell their home for less than is owed to the bank. Short Sales are different from foreclosures because a foreclosure is a forced sale. With a Short Sale the home owners have the option to hire their own Realtor® to complete the transaction. Short Sales are usually a much longer process than a tradition sale. That is because the seller, Realtor® and bank need to work together to get a short sale approval. Some sellers find it to be an invasive process because there are certain qualifications that must be met in order to complete the transaction. Sellers will need to fill out a packet outlining their financial situation. They will need to also provide tax records, bank statements and pay-stubs. Once the packet is submitted the bank will order an appraisal. When the appraisal comes back the bank will have a set price that they will accept. Rarely will the bank take less than 86% of the appraised value of the property. A Seller might need to consider a short sale for a couple of different reasons. The two most common reasons are a change in their financial situation or if they find themselves to be “underwater” in the home. Short Sales became much more common after the housing market crash in 2008. Many people lost their jobs or found their income to be a fraction of what it was. As the market started crashing individuals found that they owed much more on their homes then the homes were worth. Predatory lending practices also lead to an increase in short sales. Prior to the crash, loans were much easier to get. People were able to get into homes with little to no money down and had less money saved for the unexpected. Banks would often lend much more than the homes were worth. When is the right time to look into a short sale? As soon as you know that you are going to start having long-term problems with paying your mortgage. It is much easier to get a short sale approved before the home goes into foreclosure. 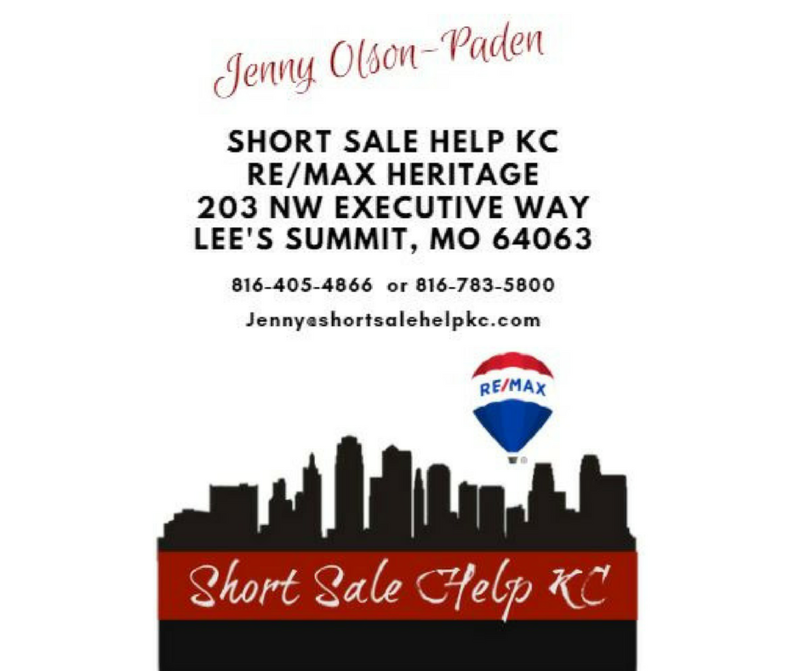 If you have any questions or want to set up a free consultation call Jenny Olson-Paden at 816-405-4866. Realtors® know that short sales are anything BUT a short process. Even though we are in an improved market, short sales and foreclosures will always be something we contend with. It is important for agents, buyers and sellers to know about the process and why it can take longer than a traditional sale. The bank is agreeing to take less than is owed on the property, therefore they want to get a complete idea of the seller’s finances and why the sale will be short. This can be a time consuming and an invasive process. The seller will be asked to provide bank statements, pay stubs and tax information. These items are time sensitive and will need to be updated throughout the sale. Once everything has been submitted it could take up to 30 days for the bank to review. Once the bank has determined that a short sale is an option they will order either a BPO (Broker Price Opinion) or an appraisal. This could take anywhere from 10 days to 2 weeks. Occasionally the figure the bank requests is much higher than market value. The selling agent builds a case and presents their own evidence of why it should be lower. That could add an additional 30 to 45 days. Once a offer is presented the bank will assign a negotiator and they will have 30 days to review it. During this time the selling agent will provide closing documents so the bank will know how much of a loss they will be taking. Sometimes there will be a next level negotiator that could add an additional 30 days to the process. Things that can hold up the process even more! Multiple Banks ~ Properties with both first and second mortgages can take double the time since both mortgage companies will need to approve the sale. High appraisal ~ if the appraisal comes in higher than it should, the selling agent could be building a case to get a new appraisal. The lender is dealing with internal issues. It is not unusual for banks that don’t have a streamlined system to be backlogged and require multiple submissions of documents. Sellers that take some time to get documents together to submit. If you are working with an experienced short sale agent, they are working hard to get the sale to go through. Patience from all parties is key. Threatening to walk away from the sale will not cause the bank to work faster, in fact it can cause them to work slower. Why would they want to put effort into a sale that could potential walk away at any moment? Make sure you are working with a Realtor® that understands the short sale process. Open communication and patience is what is needed for a successful transaction.